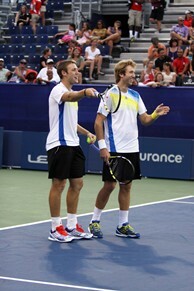 BroDown Showdown champions Jack and Eric Sock enjoy their time in front of the Atlanta crowd. As the sun began its descent beneath the ominous-looking clouds, spectators settled down to watch the highly anticipated BroDown Showdown. Not deterred by the threat of rain, the crowd cheered loudly as the four sets of brothers made their entrance onto Stadium Court. First up in the event’s action were Thomas and James Blake, taking on "brothers" and former Georgia Tech teammates, Juan Spir and Kevin King. From the get-go, hilarity ensued as fellow "bro" Jack Sock chastised frequent doubles partner James for his early signs of inconsistency. With Jack serving as referee, Ryan Harrison played his hand at ball boy, though younger brother Christian openly criticized his lackluster skills. Play commenced at a very high level, as a flurry of stab volleys had the crowd on their seats. Great play from both teams continued up until, with nearly every rally extending beyond 5 shots. At this stage, the Georgia Tech brothers scored a sweet passing shot that zipped through both Blakes and established the momentum that would carry the pair to their first match point several minutes later. However, the Blakes saved this opportunity and later secured their own match point. Great net play prevailed, as Georgia Tech’s Spir saved a match point with a final volley to end a lengthy rally. Unfortunately for the honorary brothers, the Blakes would ultimately deny them a chance at redemption as James slammed an ace to close a highly entertaining first rubber. The Harrison brothers were next to take the stage, squaring off against Jack and Eric Sock. The affair started in promising fashion when Christian used the coin toss as an opportunity to pull down Ryan’s shorts in full view of the crowd. Indeed, the first point was full of drama: Harrison rocketed down a first serve only to see the younger Sock brother nail a forehand return back down the line amidst the audience’s loud cheers. This start proved a promising omen for the Socks, as they would go on to win the encounter 10-8, setting up a clash with the Blake brothers. Starting with a double fault by James and a pair of poor errors from both teams, the brothers collectively decided to bring in ball-kid replacements to play a few points, much to the crowd’s delight. As the match resumed, both teams went back and forth in terms of a lead, but a pair of booming serves from the Sock brothers sealed the deal with a score of 10-8. Dropping to their knees in faux-disbelief, the Sock brothers charmed the satisfied crowd, while snarky comments were continuously uttered from the sidelines by the already vanquished bros. The BroDown Showdown may be over for now, but given the crowd’s positive reception and the competitive spirit of the teams, you can be sure everyone will be eager to see if the Socks can retain the coveted title of "Top Bros" next year.